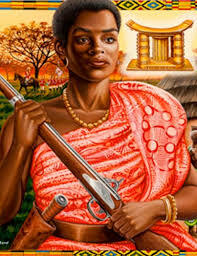 Yaa Asantewaa was named Queen Mother of the Ejisuhene (part of the Asante or Ashanti Confederacy) by her exiled brother Nana Akwasi Afrane Okpese. Prior to European colonization, the Ashanti people developed an influential West African empire. Asantewaa was the Gatekeeper of the “Golden Stool” (Sika ‘dwa) during this powerful Ashanti Confederacy (Asanteman), an independent federation of Asanti tribal families that ruled from 1701 to 1896. The story of Queen Mother Nana Yaa Asantewaa is a story of the modern history of the nation of Ghana, Africa. In 1896, Asantehene (King) Prempeh I of the Asanteman federation was captured and exiled to the Seychelles islands by the British who had come to call the area the British “Gold Coast.” Asantewaa’s brother was said to be among the men exiled with Prempeh I, deported because of his opposition to British rule in West Africa. In 1900, British colonial governor Frederick Hodgson called a meeting in the city of Kumasi of the Ashantehene local rulers. At the meeting, Hodgson stated that King Prempeh I would continue to suffer an exile from his native land and that the Ashanti people were to surrender to the British their historical, ancestral Golden Stool – a dynastic symbol of the Ashanti empire. In fact, power was transferred to each Asantahene by a ceremonial crowning that involved the sacred Golden Stool. The colonial governor demanded that it be surrendered to allow Hodgson to sit on the Sika ‘dwa as a symbol of British power. “Now I have seen that some of you fear to go forward to fight for our King. The Ashanti-British “War of the Golden Stool” was led by Queen Mother Nana Yaa Asantewaa with an army of 5,000. While Yaa Asantewaa was captured by the British and deported, her bravery stirred a kingdom-wide movement for the return of Prempeh I and for independence.